Expedia is one of the leading online travel companies with their goal to help make traveling simple and easy. From planning to booking, you'll find everything you need with their wide selection of hotels, flights, rental cars and vacation packages. Get Up to $583 off book flights plus hotels. Restrictions may apply. Get Up to 10% Off Select Budget car rentals. Hotels Bookings: Up to 30% off Oahu Hotels Bookings in Hawaii! Save up to 30% on Oahu Hotels in Hawaii! Excludes group travel. Book now and save on private cars and shared shuttles. Take the hassle out of getting out of town. New Years Eve! Get an Extra 19% off select hotels. $1000 maximum savings. Travel by March 31, 2019. Get up to 34% off select things to do in Los Angeles. Restrictions may apply. Get up to 30% off featured Hawaiian island hotels. Restrictions may apply. Get Up to a $500 onboard credit when you book a select Cruise per cabin. Get 40% off Daily Deals on Featured Hotels + Flight. These scorchin’ deals change daily at 12:00 AM (PDT). Check the page every day to uncover new deals. Plan your Disney Dream Vacation – be it a trip to world-famous theme parks in Orlando, Florida, a family-friendly cruise, or an exotic guided tour. Expect nothing less than extraordinary in your favorite Disney Destination! Escape to the Dominican Republic and find your paradise today! Expedia Local Expert is a one-stop resource with local activities, tours, and transportation in more than 750 different vacation destinations. Get insider tips, locals-only insight, and tried-and-true travel expertise. Flight + Hotels Bookings: Save on Africa Travel! Save on Flight and Hotel when you travel to Africa. Discover the adventures with Expedia’s best price guaranteed. Save up to $583 when you book your Flight + Hotel together. Save up to $1910 on Delta Air Lines Package Deals to London. Get up to $75 Onboard Credit on Your Norwegian Cruise Bookings. Save Up to 40% on Bookings at Participating Hotels in Peru. Free Cancellation on New York City activities! Free Cancellation on New York City activities! Get ready for 24/7 fun and excitement. Save 5% on Payless leisure daily, weekly, weekend, and monthly rates. Offer applies to all car groups. Offer is available for U.S. residents only for rentals at participating locations in the U.S. and Canada. Holiday and blackout dates may apply. Find great deals at top ski resorts at Expedia.com! Check out things to do in Las Vegas. Save 10% off $400 2+ Nights Hotels in Las Vegas, New York City, San Francisco, and Orlando. Flight + Hotel Booking: Deals for $499 or less! Get Packages under $499 per person – Vacation now! Discover all the beauty and adventure that New Zealand has to offer! Book your Adventure Travel on Expedia.com: Explore, discover and escape! Get up to 36% off select deals in Orlando. Limited time offer. No code needed. Restrictions may apply. Get Up to 25% Off with Budget weekly and weekend rate cars. Weekend rate available Thursday noon, car must be returned by Monday 11:59 p.m., or higher rate will apply. Hotel deals under $99 per night – Book now! New Year’s Coupon! Get an Extra 19% Off Selected Hotels. While supplies last. Terms and conditions apply. Riviera Maya Summer Sale! Save Up to 50% + Up to $1000 Resort Credit and more. Available at participating hotels. Minimum stay may be required. Blackout dates may apply. Get Up to 30% Off Avis weekly and weekend rate cars. Book a travel package with Expedia & save 100% on your flight bookings. Get up to 30% off participating hotels in Peru. Restrictions may apply. 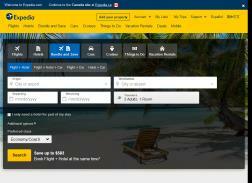 See all of Expedia page for online coupons, promo codes, sales, deals and more!